With one team already in the EuroCup final, it is all or nothing for the two teams playing in the semi-final. The score is tied at 1-1 between Valencia and Hapoel Bank Yahav and as this is a best of three series, everything is on the line on this game. Unicaja Malaga are already in the EuroCup final, so we could have an all-Spanish affair if the home side prevails on Wednesday night but it was the Israeli side that bagged the win in the second game to take it to the final match-up. Home court advantage has been a factor in both games between these sides in the semi-finals and if that prevails again, it is Valencia who will be smiling come the end of the evening. The Spaniards have a 9-1 record at home this season, so that will leave them feeling confident but it should be remembered that their only defeat came at the hands of Hapoel. 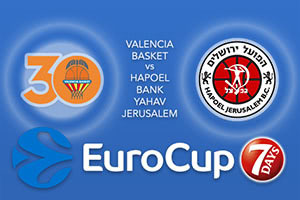 The 77-81 reversal in the regular season will leave the Valencia fans slightly edgy about what may happen in this game. Whoever comes out on top in this game grabs the home court advantage for the EuroCup final, but just getting to the final should have more than enough incentive behind it to ensure both sides are up for this game. Game 1 in the series finished 83-68 in favour of Valencia, with Fernando San Emeterio grabbing 21 points in the win. Game 2 went the way of Hapoel, finishing 79-66 with Tarence Kinsey grabbing 18 points in that victory. This game features players who can score points and with Rafa Martinez 15 points away from becoming the all-time top scorer in the EuroCup, and Bojan Dubljevic being 27 points away from that accolade, there is a chance for players to write themselves into the history books. Given the result of Game 1 in the series, you can back Valencia at -7.5, which is provided at odds of 1.90. If you’re looking for the Over/Under market for this game, go OVER 154.0 which is provided at odds of 1.90. Bet Now!